SACRAMENTO, Calif. (AP) From the moment he signed with the Kings last offseason, Zach Randolph fully embraced his role as a veteran mentor in the locker room for a mostly young team. Sacramento’s 36-year-old power forward is still getting it done on the court, too. And in crunch time, no less. 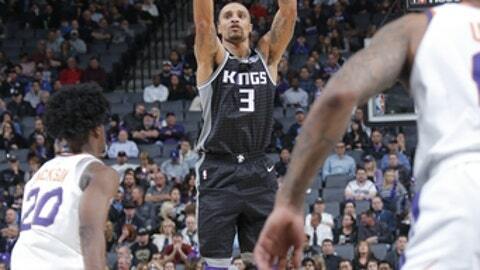 Randolph scored 11 of his 17 points in the fourth quarter to spark a big run, and the Kings rallied past the slumping Phoenix Suns 99-92 on Tuesday night. Randolph missed seven of his first 10 shots but was perfect on four attempts in the fourth quarter, all of them coming after the Kings fell behind 85-80 with six minutes remaining. Sacramento scored the next 13 points to take control. The Kings’ big man, who had seven rebounds and five assists, made a three-point play with 44.9 seconds remaining to secure the win after getting fouled by Tyson Chandler. George Hill had 18 points and seven rebounds in his return to the starting lineup. Buddy Hield scored 14 points and Willie Cauley-Stein added 13 points and six rebounds to help the Kings win for the second time in five games. The late scoring flurry was a departure from the rest of the game, when both teams struggled to score with much consistency. Phoenix built an early 10-point lead in the first half but went scoreless for more than five minutes in the fourth quarter and lost its fourth straight. The Suns, who have dropped nine of 11, fell to 0-3 since losing leading scorer Devin Booker to a left adductor strain. TJ Warren scored 18 points for Phoenix. Mike James added 17 points and five assists. The teams combined for 15 lead changes before Sacramento pulled away behind Randolph. Warren scored two quick buckets early in the fourth quarter and Dragan Bender made a 3-pointer to put the Suns up 85-80. Randolph hit back-to-back baskets then fed Hill for a reverse layup. After a 3 by Hield, Randolph made two free throws and then scored down low to put the Kings up 93-85. Tyler Ulis and James scored to cut the gap to 93-89 before Randolph’s three-point play. Suns: James, Troy Daniels, Josh Jackson and Bender made consecutive 3s without a miss as part of a 12-2 run in the second quarter. Kings: Sacramento committed nine turnovers. … Hill returned to the starting lineup after sitting out one game for personal reasons. … Cauley-Stein had missed three games with a lower back strain. Suns: Host the Toronto Raptors on Wednesday in the second half of a back-to-back. Kings: At the Minnesota Timberwolves on Thursday.